The class will meet for six weeks (see registration form for dates and times) and will be for beginners. In this class you will learn the basic skills of watercolor painting: materials, how to mix colors that are fresh and not muddy, how to make beautiful darks and neutrals, different ways of applying the paint, contour drawing, and much more. The focus of the class will be painting in a loose style. In the class you will learn how to let the brush and the paint do most of the work and how to suggest things instead of state every detail. You’ll learn how to paint flowers, trees, skies, landscapes, buildings, people and much more in a loose painterly style. If you’re interested in the class here’s the registration form and supply list. Just print it and mail in the registration form to the Hendersonville Arts Council with the payment. You can also get the registration form and supply list from the HAC website. 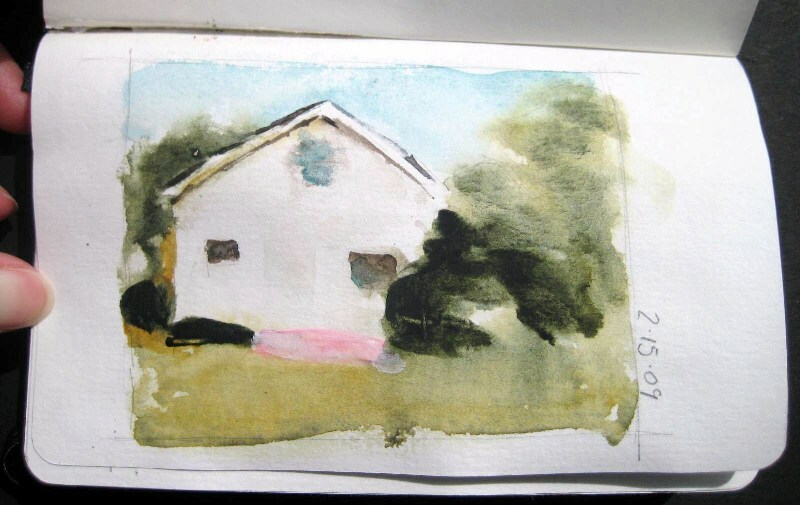 Below is a sketch I did in my small (5″ x 3″) sketch journal of an old house. What if you cannot even draw a stick man? Good question Tracy! This is a beginners class – I’m going to be teaching some easy tricks to drawing that anyone can do. I really think anyone can do this class and will have fun and have great success. One of my art teachers said she couldn’t draw a stick man when she started either. Hi, Sandi, I found your website after Mary Julia Kaiser told me about your artwork. I love coming to your site to see what new paintings you will have up next. If only I could take your class this summer! I love your work- it is so beautiful! I’ve taken watercolor classes before, but I would still consider myself a beginner! Ruth Ann, thanks for stopping by! Mary Julia is one of my favorite people on this earth!!! Thank you for the kind comments about my artwork. I would LOVE for you to join the classes this summer – are you considering it? It’s not too late to sign up!